Today, we’re talking about seven easy ways to stay focused on your goals. Well, it’s so important to stay focused on your goals, no matter if you’re talking about project goals, career goals, those in your personal life, or even health and fitness. Because no matter what’s happening, there always distractions all along the way when you’re trying to get from your current state to your future goals. Well, what could some of the distractions be? Well, it could be clutter around your workspace, it could be family and friends who are wanting to always dominate your time, it could be hobbies, it could be sleep, some people opt for sleep instead of working on their goals, it could be house chores, it could be social media or even events. So I think it’s important to identify these when you’re talking about your goals. 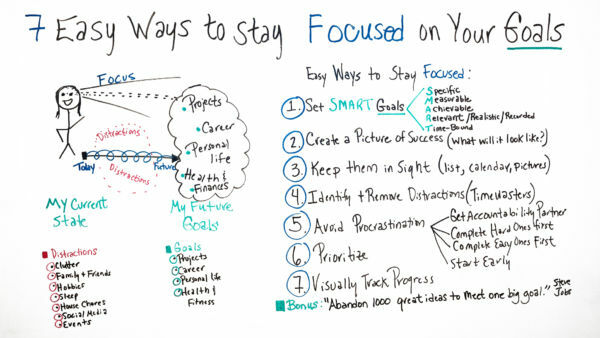 So let’s talk about some of the easy ways to stay focused. Well, it’s important to me to talk about smart goals when we’re talking about goals. And that means they need to be specific. So say if you have a goal to read 10 books by the end of the year, layout specifically, how you’re gonna do that. Maybe one a month or…and then specifically what titles. You also want them to be measurable. How are you gonna measure and track your progress all along the way? And you wanna make sure it’s achievable. If you’re trying to read 10 books by the end of the year and you’re traveling, and you have heavy projects, not a lot of available time, it may not be achievable for you to do that. You also want it to be relevant. To say, for me, I’m in business so I’m always reading business books or professional growth. But if it’s not related to that, maybe if they’re 10 books on mystery books, it may not be relevant to what I’m trying to do, may not be, again, be realistic. And some people think it’s important to record them, like document these goals. There also need to be time bound. So say if I wanted to read 10 books, but I never really declared when I wanted to do it, to say it’s important for me to do it by the end of the year, but I never declare it, so maybe by the end of a couple of years, I still haven’t done it. So it’s important to say when you’re gonna do those. It’s also important to create a picture of success, what will it look like? And that’s why I believe that vision boards are so successful. Also, keep them in sight. Be always looking at your goals, whether it’s maybe a list, a list of things, and how you’re going to achieve the goals. Even put them on a calendar, like milestones. And again, pictures. Also, identify and remove the distractions. So the distractions we’re talking about, it’s important to understand what they are for yourself and then eliminate those time wasters. Then avoid procrastination. It’s a lot of time easy if you’re trying to achieve big goals, it can be overwhelming sometimes. So you want to put some techniques in place to get you moving forward. So it could be an accountability partner. I know for myself, I have an accountability partner that have my goals, and if I don’t meet those I have to talk about those and really move through those barriers. Some people like an approach of completing the hardest steps or the hardest goals first. And on the flip side, some people like to complete the easy ones first, it’s really preference. I found very successful people who meet their goals and it just is on preference. Also, some people like to start early, do some of the more challenging things first. So it’s all up to you, but getting a strategy is important. Also prioritize your goals. If you have too many goals, know which ones are the most important, so you’re working on those first. And visually track your progress all along the way. So know what your goals are, what your milestones are, and when you see that you’re making progress, it is encouraging and inspiring to keep going. There’s a bonus here with the background and technology. I follow Steve Jobs a lot, and he’s well-noted for having a laser focus. So he says, “Abandon 1,000 great ideas to meet that one big goal.” So if we continue to create new ideas and new goals, we’re never really gonna meet the one that’s the most important. So as you can see, a tool can really help you with your goals and your milestones.